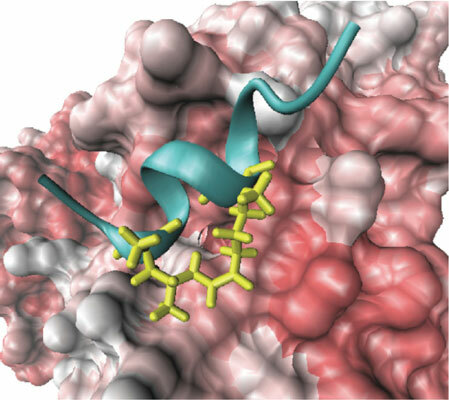 Keywords: Stapled peptides, protein-protein interactions, peptide therapeutics, hydrocarbon, infectious disease, cancer. Keywords:Stapled peptides, protein-protein interactions, peptide therapeutics, hydrocarbon, infectious disease, cancer. Abstract:Anomalous protein-protein interactions (PPIs) have been correlated to a variety of disease states, such as cancer, infectious disease, neurological disorders, diabetes, endocrine disorders and cardiovascular disease. Stapled peptides are an emerging intervention for these PPIs due to their improved structural rigidity and pharmacokinetic properties relative to unstapled peptides. This review details the most recent advances in the field of stapled peptide therapeutics, including the increasing variety of PPIs being targeted and types of peptide staples being employed.